Yoshino is also an old center of spiritual assertion, with the fierce deity Zao Gongen 蔵王権現　at its center.
. WKD : Yoshinoyama 吉野山 Mount Yoshino . 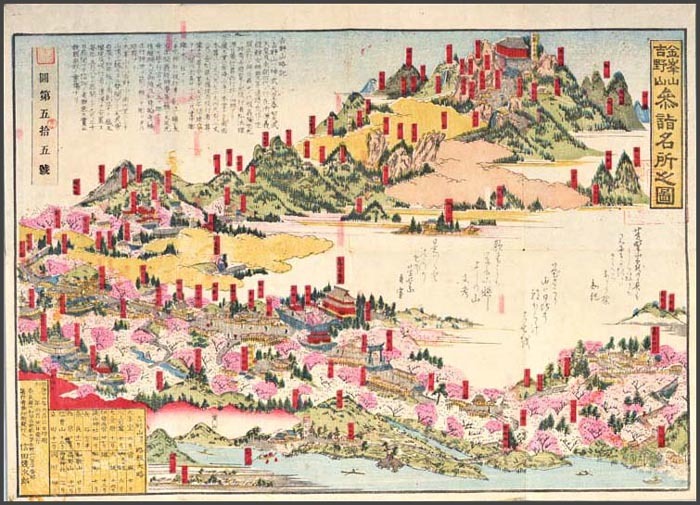 Basho visited Yoshino during his "Weatherbeaten Trip" in 1684 - 84. He describes the small huts of the forest workers and the echo of the temple bells. To him it looked like the famous Mount Lu in China.
. kinuta uchite ware ni kikase yo ya boo ga tsuma .
. Basho and Saigyo　芭蕉 - 西行 . 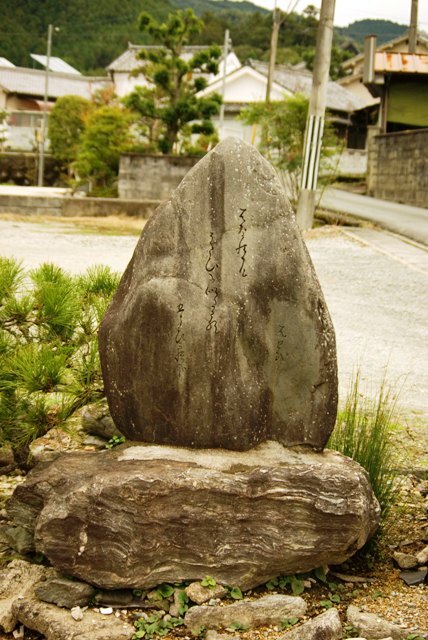 Memorial Stone at Hirao village. 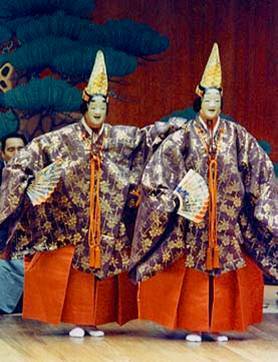 I feel myself to be in a Noh play. 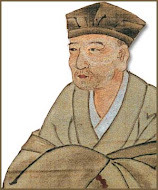 Written in 1688, Basho stayed at Hirao Village 平尾村. utai here refers to a famous Noh song 謡曲 (yookyoku) about "Futari Shizuka" 二人静. 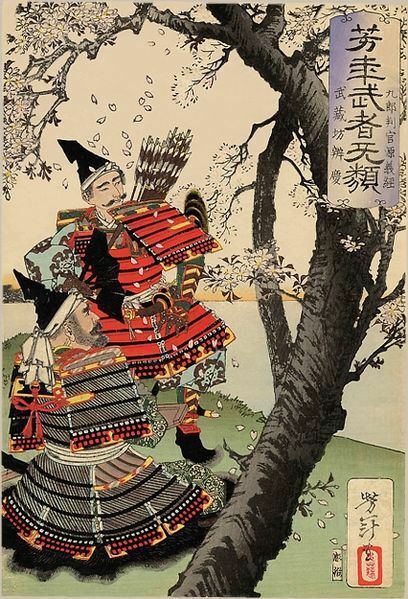 While Basho enjoys to sleep on his travels, he is reminded of the tragic story of Shizuka and Yoshitsune.
. Oi no Kobumi 笈の小文 . This is also the name of a plant, Chloranthus serratus, and a kigo for late spring. One early spring a Priest from Yoshino stood along the banks of the Natsumi River. It was the seventh day of the first month and he was watching over the women as they were plucking new shoots for the Festival of Young Herbs. He had called his Servant to him and instructed him to gather everyone up, since it was getting late in the day. One Village Woman malingered in returning, and the Servant scolded her for it. The Priest was shocked. Had the poor Village Woman lost her mind? Suddenly realizing that she had become possessed, he begged the spirit to speak its true name so he might better pray for them. Who are you, he said? One who served Yoshitsune replied the possessing spirit. Might you be Kanefusa, Yoshitsune’s loyal friend, asked the Priest? Kanefusa was indeed a loyal vassal, said the possessing spirit, but I am not him. He ended his own life after the death of Yoshitsune, setting fire to the mansion and dying in the blaze. I am not he; in truth I am a woman and accompanied Yoshitsune as far as he would allow it. The sleeves of my robe are soaked with the endless tears of my love and devotion for him. It was beyond the possessing spirit’s ability to even speak her own name aloud. Might you be the Lady Shizuka, asked the Priest? If so, then you were well known for the beauty of your dance. Please, dance for us now, and I will pray for your release from this world with an open heart. It is true, I loved to dance, she said, and I had made an offering of my dancing robes to the Katte shrine before my departure. If you are truly Shizuka, said the Priest, then what color were your robes? The hakama were deepest azure, made of raw silk and striped with gloss, and the jacket was covered in flowers like the fields of autumn. The Priest looked in the shrine treasury, and behold, the dancing robes were just as the spirit of Lady Shizuka had described. Please, he said, put on these robes and dance for us. Gathering his attendants they watched, enraptured, as the possessed Young Woman donned Lady Shizuka’s robes. 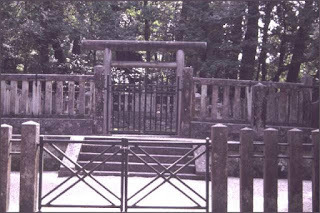 After Yoshitsune’s departure by his own hand, the Lady Shizuka had been summoned before Yoritomo. In her womb was Yoshitsune’s unborn son. Dance for me, Yoritomo declared; show me your renowned skills! With broken heart, and terrible longing she danced against her own desires, her soul overcome with bitterness. The two Lady Shizuka’s danced slowly, their sleeves gracefully sweeping the ground, almost but not quite touching, almost but not quite intertwined. There was an old poem about love, about wishing that there was a way to make the past into the present – but for Shizuka the past brought only sadness. For her unhappiness was surely the only unchanging thing in this transient world.
. Yoshitsune and Benkei　義経と弁慶 .
. 牛若丸　Ushiwakamaru 源の義経　Minamoto no Yoshitsune . is a Japanese play, one of the three most popular and famous in the Kabuki repertoire. On the way down from Yoshino mountain Basho passed this mausoleum and the temple Nyoirin-ji.
. gobyoo toshihete shinobu wa nani o shinobugusa . This is a pun with the word SHINOBU.
. WKD : shinobugusa 忍草 weeping fern, hare's foot fern .
. horo horo to yamabuki chiru ka taki no oto . at the waterfall Nijkoo no Taki 西河の滝 Nijiko no Taki.
. ryuumon no hana ya joogo no tsuto ni sen .
At the Dragon Gate Waterfall 龍門瀧 in Yoshino.